High school student in moderate condition after falling more than 30 feet during a school hike in southern Israel. On Sunday afternoon, a 17 year old student was moderately injured after she fell 10 meters (approximately 33 feet) down a ravine during a high school trip in Nahal Zohar, in the southern Judean Desert. The student was treated by MDA medics and paramedics, Arad and Ein Gedi rescue teams, as well as IDF medical personnel. 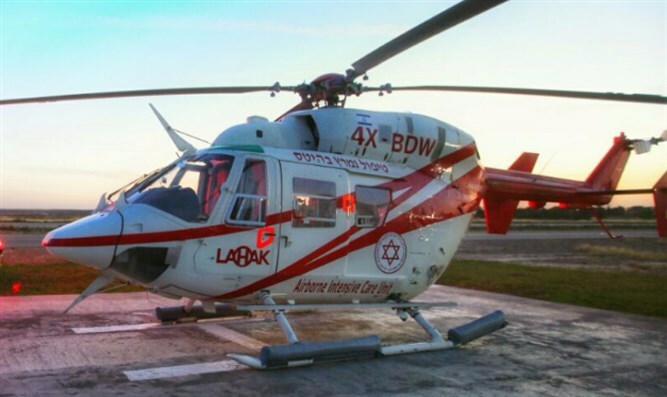 The student was evacuated by a military helicopter to Soroka Hospital in Be'er Sheva where her condition was reported to be moderate and stable. Senior MDA Medic Sarah Yisraeli and MDA Paramedic Elad Pas said, "We arrived with the Mobile ntensive Care Unit to the Zohar Junction where we met up with a 4X4 vehicle that drove us into Nahal Zohar. We had to descend into the ravine to which the young woman fell with all the necessary medical equipment by foot." "The injured girl was lying in the bottom of the ravine, conscious and suffering from injuries to the head and limbs. We treated her with first aid in the field and a few moments later an IDF doctor and army medics joined us in treating her. She was then attached to a special stretcher and put into an IDF military helicopter that had been hovering overhead. She was completely conscious. "